from iliac crests through lesser trochanter. Prescribe plane parallel femoral heads. Prescribe plane perpendicular to coronal plane. Scan from acetabulum through greater trochanter. Prescribe plane parallel to femoralneck. Scan through entire femoral neck. Use COR PD and angle parallel to femoral neck (use image with the longest medial/inferior femoral neck cortex). This angle is usually slightly more than you think (see image). Magnetic resonance imaging (MRI) of hip joint - is one of the most promising and rapidly improving techniques of modern diagnostics. In this case, the doctor is able not only to investigate the structural and pathological changes, but also to assess the physico-chemical, pathophysiological processes of the hip joint as a whole or its individual structures. Magnetic resonance imaging (MRI) of hip joint in frontal projection (ligaments, articular cartilage) in osteoarthritis (coxarthrosis). Magnetic resonance imaging (MRI) of hip joint in the axial projection (ligaments, articular cartilage) in osteoarthritis (coxarthrosis). Magnetic resonance imaging (MRI) of hip joint in the sagittal projection (ligaments, articular cartilage) in osteoarthritis (coxarthrosis). Coronal T1 large field of view allows for evaluation of both hips simultaneously even though the patient may be symptomatic in only one hip. Coronal IR large field of view allows for detection of abnormal fluid in both hips which may be seen in avascular necrosis, stress fractures, muscle tears or perilabral cysts. Axial T1 large field of view allows for evaluation of both hips simultaneously, particularly the acetabulae. 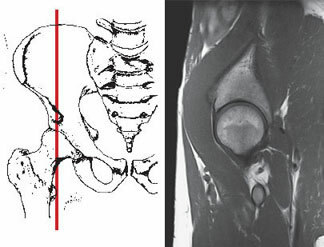 Sagittal PD fat suppression of the affected hip is sensitive to fluid that may be present with avascular necrosis or stress fractures. Notice the decreased SNR. This is due to a combination of a large coil and decreased field of view. A large coil was used to image both hips initially in the coronal and axial planes and was not changed midstream through the exam. For dedicated imaging of a single hip during arthrogram, a smaller field of view with a dedicated coil or flexible surface coil is used, allowing for visualization of smaller structures such as the labrum. Notice the decreased SNR due to the smaller field of view. Since hip pathology is often bilateral (e.g., osteoarthrosis, avascular necrosis), the routine hip protocol uses a large field of view (torso or body coil). In cases where pathology is unilateral (such as a labral tear during an MR arthrogram) a smaller field of view should be used by employing a dedicated surface coil to keep SNR acceptable while increasing spatial resolution. A hip MRI will include parts of the upper femur, acetabulum (groove for the femur in the pelvis) and nearby pelvic bones. The hip MRI can detect bone bruises, fractures, cysts, tumors, infection and dislocations. An MRI can also determine the extent of arthritis and help in pre-operative planning. Hip MRIs are very good at looking at the cartilage and labrum (a ring of cartilage) in your hips. MRI can detect fraying (like frayed edges of jeans), fissuring (cracks, similar to a dry river bed), and defects (the cartilage is missing). Damaged cartilage or injury to the labrum can lead to arthritis. Some hip MRIs are done with a direct injection of contrast material into the joint to get a detailed look at the cartilage and labrum. 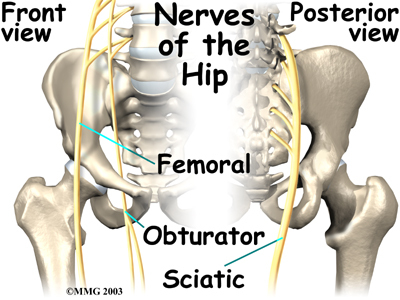 Your hip has many nearby tendons and ligaments that help with motion and stabilize the joint. Any of these can be injured and may only be detected on MRI. This refers to the muscles and tissues around your hips. A hip MRI scan will show parts of the thigh muscles and muscles of the buttocks area. MRI can detect muscle tears, strains, tumors and infection. The hip is a ball-and-socket joint composed of the acetabulum and the femoral head. The acetabulum is partially covered by articular cartilage, a horseshoe shape opened inferiorly. The central portion or acetabular fossa is filled by fibrofatty tissue. The teres ligament originates in this fossa and inserts into the fovea capitis of the femoral head. 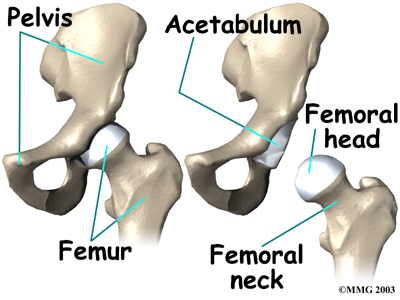 A rim of fibrous tissue called the "acetabular labrum" surrounds the acetabulum. The joint capsule extends from the acetabular margin to the femoral neck, and it is reinforced anteriorly and posteriorly by a series of capsular ligaments. 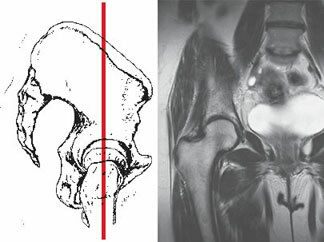 Figures 1, 2, and 3 depict the normal MRI anatomy of the hip in the three orthogonal planes. is the material that covers the ends of the bones of any joint. A small ligament connects the very tip of the femoral head to the acetabulum. This ligament, called the ligamentum teres doesn’t play a role in controlling hip movement like the main hip ligaments. It does, however, have a small artery within the ligament that brings a very small blood supply to part of the femoral head. A long tendon band runs alongside the femur from the hip to the knee. 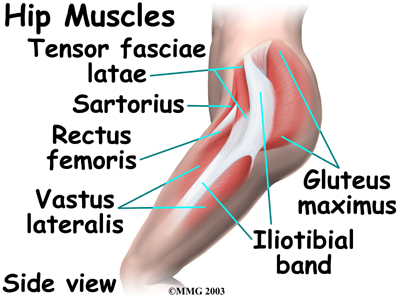 This is the iliotibial band, It gives a connecting point for several hip muscles. A tight iliotibial band can cause hip and knee problems. 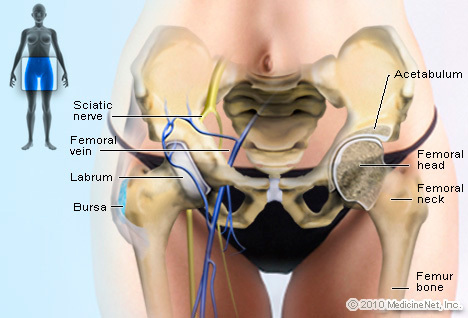 A special type of ligament forms a unique structure inside the hip called the Iabrum. The labrum is attached almost completely around the edge of the acetabulum. The shape and the way the labrum is attached create a deeper cup for the acetabulum socket. This small rim of cartilage can be injured and cause pain and clicking in the hip. The hip is surrounded by thick muscles. The gluteals make up the muscles of the buttocks on the back of the hip. The inner thigh is formed by the adductor muscles. The main action of the adductors is to pull the leg inward toward the other leg. The muscles that flex the hip are in front of the hip joint. These include the iliopsoas muscle. This deep muscle begins in the low back and pelvis and connects on the inside edge of the upper femur. Another large hip flexor is the rectus femoris. The rectus femoris is one of the quadriceps muscles, the largest group of muscles on the front of the thigh. Smaller muscles going from the pelvis to the hip help to stabilize and rotate the hip. These nerve carry the signals from the brain to the muscles that move the hip. The nerves also carry signals back to the brain about sensations such as touch, pain, and temperature. The first decision to make with hip MRI is whether to image both hips simultaneously or only the symptomatic hip. It is an important decision since it will influence other decisions such as coil and pulse sequence selection, as well as whether or not to inject contrast material, intra-articularly or intravenously. This decision is compounded by the common situation in which no clinical information is provided to the radiologist. As a general guideline, imaging of both hips simultaneously may be appropriate if one is looking for osteonecrosis (given the frequency of bilateral involvement) or metastasis. In most other clinical situations, single hip imaging provides better spatial and contrast resolution, since a dedicated surface coil can be used. When bilateral hip imaging is chosen, the body coil, preferably phase array, is used. 1 The following set of pulse sequences is recommended: T1-weighted coronal and fast-spin echo (FSE) T2-weighted or short tau inversion recovery (STIR) axial. If there are positive findings, one may choose at this time to stop or to switch to single hip imaging. This is done by using a dedicated surface coil, such as a flexible coil, for better anatomical resolution of small structures such as the acetabular labrum, or for better evaluation of the articular surfaces or subchondral area of the femoral head. When single hip imaging is indicated, the following pulse sequences are recommended: Coronal T1-weighted high resolution with 512 matrix, axial T2-weighted FSE or STIR and sagittal two-dimensional (2D) or three-dimensional (3D) gradient-recalled echo (GRE) (fast low-angle shot [FLASH], spoiled gradient-recalled acquisition in a steady state [SPGR]) or T2-weighted or STIR sequences. Intravenous contrast material may be useful to assess tissue viability in osteonecrosis and in cases of suspected infection or bone or soft-tissue tumors. T1-weighted high-resolution images with fat saturation in the axial sagittal and coronal planes are recommended when using intravenous contrast material. The most recent innovation is the so-called "indirect" MR arthrogram (IMRA), replacing the intra-articular or "direct" MR arthrogram (DMRA). 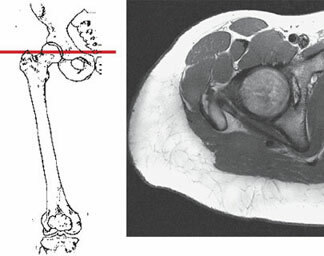 Indirect MR arthrogram is performed by injecting, intravenously, a standard dose of a gadolinium chelate (1 mmol/kg). This is then followed by 10 to 15 minutes of gentle exercise before T1-weighted fat-saturated imaging with high resolution in all three orthogonal planes, in addition to a T2-weighted sequence, preferably in the axial plane. This technique provides enough diffusion of contrast material through the synovium to outline the articular surfaces and produce some distension of the capsule and its recesses. An added advantage of IMRA is that it produces enhancement of hyperemic tissues. Furthermore, if a pre-existing joint effusion is present, the injected contrast material mixes with the joint fluid, giving an excellent arthrographic effect with high resolution provided by the use of the T1-weighted fat-saturated images with 512 matrix. The DMRA technique entails the placement of a needle into the hip joint, generally using fluoroscopic guidance, and injecting 10 to 15 mL of dilution of a gadolinium chelate (0.1 mL) and saline (20 mL). The patient is then taken immediately into the MRI suite, and the same pulse sequences described for IMRA are used. The main advantage of DMRA over IMRA is the full distension of the joint capsule and its recesses. The disadvantages, however, are significant: DMRA requires additional scheduling for fluoroscopy and is an invasive procedure with added morbidity. The indications for IMRA or DMRA include assessment of the articular surfaces when studying osteochondritis dissecans and assessment of the acetabular labrum.